A new analysis based in Oakland, Calif. identifies more than 50 strategies for building community resilience and adapting to climate change impacts such as extreme heat, flooding, wildfire, poor air quality, and rising food, water, and electricity prices. 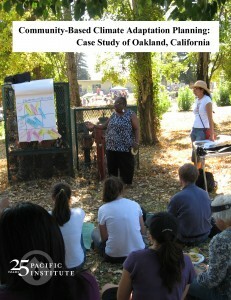 The study, Community-Based Climate Adaptation Planning: Case Study of Oakland, California, from the Pacific Institute and in partnership with the Oakland Climate Action Coalition, provides a detailed analysis of climate impacts, vulnerabilities, and adaptation options to inform the development of a comprehensive and equitable climate adaptation plan effort that engages local communities in the process. Social vulnerability to climate impacts is shaped by a variety of factors, including income, race, health, age, English fluency, etc. Of Oakland’s 400,000-plus residents, nearly 60% reside in census tracts with a high social vulnerability. Areas of high vulnerability are largely concentrated in the southern and eastern portions of Oakland, with areas of low vulnerability typically found east of Highway 580. A map highlighting social vulnerability within Oakland is available here. Researchers conducted a range of analyses to estimate both the impacts of and vulnerabilities to climate change and worked with coalition partners to identify adaptation strategies that can be implemented at the local level, their advantages and disadvantages, and social equity concerns associated with them. They also enumerated best practices in climate adaptation planning processes. Social equity concerns are often not fully acknowledged nor adequately addressed in identifying adaptation strategies, and so a primary focus was the need to meaningfully engage the wider community in adaptation planning. The research identified geographic areas within Oakland with heightened risk of projected climate impacts, as a guide to policymakers and affected communities on where to focus climate adaptation efforts. Using detailed maps of climate impacts and social vulnerabilities for California, the Pacific Institute looked in detail at the social vulnerabilities in Oakland from climate impacts like extreme heat, wildfires, coastal flooding due to sea-level rise, and particulate matter concentrations in the air. Additionally, community stakeholders identified future food, water, and electricity prices as a key concern, elements that depend on many factors other than climate. -Adaptation Strategies for Extreme Heat, such as developing early warning systems for extreme heat events and incorporating public health objectives into the city general plan, opening cooling centers during extreme heat events, public outreach/education, and more. -Adaptation Strategies for Floods, such as installing green infrastructure, preserving/restoring wetlands, raising existing structures above flood level, limiting development in flood plains, building or expanding protective infrastructure where appropriate, developing and supporting local food supply, and more. -Adaptation Strategies for Wildfires, such as managing vegetation, ensuring adequate shelters are in place as part of wildfire emergency response plans; requiring new construction builders to bury utilities during construction phase in high fire risk areas; developing comprehensive community-based plans for emergency evacuation, response, and recovery; and more. -Adaptation Strategies for Rising Utility and Food Costs, such as providing incentive programs to promote installation of water/energy efficient appliances and fixtures; developing and supporting local food systems; developing programs to reduce financial hardship of increased food, energy, and utility costs on residents; pursuing infill, smart growth, and urban renewal projects to build better integrated and more resilient communities; and more. –Adaptation Strategies for Poor Air Quality, such as insulating and sealing homes to protect indoor air quality from outdoor air contaminants, installing indoor air filtration systems and high-efficiency filters to reduce air pollution in the home, revising building design guidelines to address air quality concerns, modifying emissions reduction plans to account for increases in air pollution attributed to climate change, developing a warning system for poor air quality, and more. View the Oakland Social Vulnerability to Climate Change map. Read the Summary of Adaptation Strategies (Appendix A). *Update: Copies of the report downloaded before September 28, 2012 incorrectly stated the time period for our analysis of historical high-heat days as May 1 – October 31. The correct dates are May 1 – September 30. Data for the Oakland Case Study come from the Pacific Institute report Social Vulnerability to Climate Change in California, which identifies geographic areas within the state with heightened risk to projected climate impacts. The most significant risk from climate change occurs where there are large groups of people exposed to a climate-related hazard and where there is high social vulnerability. To compare overall social vulnerability to climate change across the state, the Pacific Institute developed a new “climate vulnerability index” that combines data from 19 different social and economic factors – such as air conditioner ownership, percentage of tree cover, workers in outdoor occupations, and more – for each of the 7,049 census tracts in the state. Read more.